A couple of weeks back, we joined Kedaar in Taekwondo in GoldMedal martial arts school in Foster City. The teacher is a 1992 gold medal winner and extremely popular in the area. Taekwondo is a different sport than the Karate Kedaar has been learning in Seattle, but several basics are same. So when the teacher took a test, Kedaar did nicely including the suprising demonstration he did by breaking a wood piece. They respected his yellow black belt earned this March and put him an appropriate class per his age and level. We are really excited about this activity and hopefully Kedaar will have fun in this too. As a first trip after we moved here, we drove to Napa valley,CA yesterday with our friends Saritha/Sree's family. The drive was beautiful and the views were amazing. Kedaar had great time in till afternoon running around in the green wineries with Isha sister and later coming back in the friend's car having fun watching movies together with other kids. Here are some picturs from the trip. In the gifts, the mirror in the picture above is the cutest of all along with a key chain. 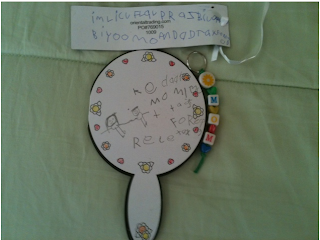 On the mirror, the sentence says "Mommy I love you, thanks for all you do, really thank you". He wrote this sentence with his own spelling. Mom. Dad, thanks for all you do." Again Kedaar wrote this with his spelling and it was so cute.